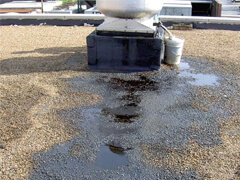 Standing grease on your roof can quickly lead to the deterioration of your roof. Not only is the accumulation of grease a major fire hazard but it can result in the caving in of your roof if not appropriately contained. 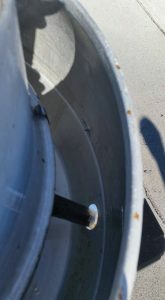 That’s why BEST HOOD CLEANING can offer a rooftop grease containment for your business in Sacramento, California. ALLOW US TO EXPLAIN IN MORE DETAIL. We like to imagine restaurant grease as this big (greasy) monster that you can’t escape from. If it’s not here, it’s there, and once it’s there, its damn hard to get rid of. Unless you call us, that is. Exhaust fans are designed to eliminate grease vapors from invading your kitchen and restaurant. But if it doesn’t end up in the restaurant…then it must go somewhere. That would be your rooftop. While we’d like to think that’s all fine and dandy, it’s not, unless you have an appropriate rooftop grease containment. A restaurant without a rooftop grease containment risk fire or serious damage to the roof of their building. Since grease is acidic, continued build-up of it can cause your roof to deteriorate. That does not sound like it would be fun for a thriving food business. Rooftop oil collector before cleaning. Rooftop oil collector after cleaning. SO HOW CAN YOU SAVE YOUR ROOF? The best way to prevent grease from damaging your roof is to install rooftop grease containment on all of your exhaust fans. A properly designed grease containment will collect excess grease from your system. It also allows rain water to drain off without damaging your roof. 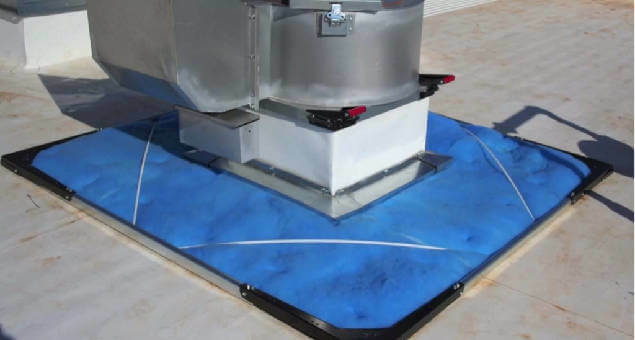 An effective rooftop grease containment will prevent hydrophobic pads, which are designed to shed water and hold onto grease. 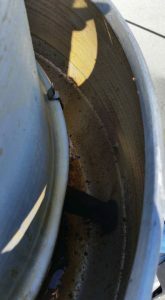 If you only have a grease box to catch grease without these pads, the rain water and grease will eventually spill onto the roof. BEST HOOD CLEANING offers rooftop cleaning services as well as the installation of a rooftop grease containment. We will always inspect the system, inform you of any hazards and address the situation as needed. We sell, install and maintain efficient systems that are designed to protect your roof from expensive repairs caused by rooftop grease. It is truly an inexpensive way to protect your roof. Seriously, businesses like you are what keep us going every day. If it wasn’t for you, we wouldn’t able to live the life we do and do a job we love (yes, we love cleaning kitchens). Your satisfaction is important to us. Sure, we like a joke every now and then, but we will always treat your business with the highest level of professionalism. We will treat your employees, you, your customers and your building with the utmost respect. We are a team of highly trained professionals in kitchen hood system cleaning and general commercial kitchen maintenance. We will always perform our work to meet the local code and high standards. If you stumbled across this but you need a hood cleaner in Tampa, we have associates there too. So what are you waiting for? Give us a call! 916-347-5300. BEST HOOD CLEANING proudly serves Sacramento, California for installing and maintaining rooftop grease containment systems and is fully insured, bonded, certified and licensed.